TIFFIN, OHIO – FEBRUARY 8, 2019 – For the third year in a row, Downtown Tiffin has been re-recognized by Heritage Ohio as a National Main Street Community. The Ohio Main Street Program, administered by Heritage Ohio, works with communities across the state to revitalize their historic or traditional commercial areas. Based in historic preservation, it focuses on four points: organization, design, promotions, and economic vitality. Each point is an integral part in the successful revitalization of a downtown area. The Ohio Main Street program is a partner of Main Street America. Accreditation is an honor that must be earned every year by meeting the program’s high standards as determined by an annual quality audit by state officials. With this distinction, Downtown Tiffin has received accreditation for its Main Street program at both the state and national level for 2018, 2017 and 2016. Downtown Tiffin’s revitalization efforts continue to be validated and recognized throughout the state. Since becoming a Main Street Community in 2015, 42 new businesses have located in Downtown Tiffin and more than $25 million in investment has occurred in the downtown, creating a vibrancy. 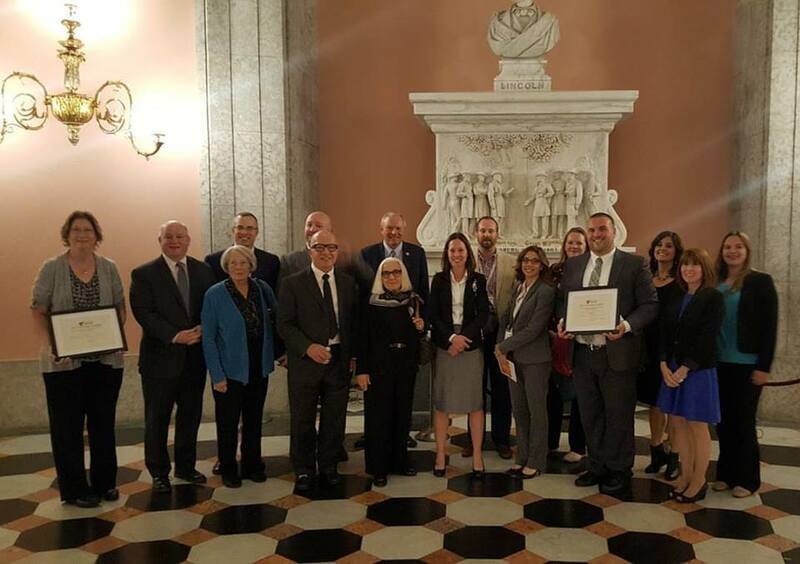 This past October, Downtown Tiffin was presented with three statewide awards by Heritage Ohio at its Annual Preservation and Revitalization Awards Ceremony. The Façade Enhancement Grant program won Best Public/Private Partnership; Suzie Reineke and Weston Reinbolt won Young Preservation Leaders; and Amy Reinhart won Main Street Manager of the Year. Started in 1983 as the Seneca Industrial and Economic Development Corp. (SIEDC), the Tiffin-Seneca Economic Partnership (TSEP) is a private, non-profit corporation dedicated to driving positive economic, downtown, and community development in Tiffin and Seneca County, Ohio. TSEP consistently ranks among the top communities statewide and nationally for economic and downtown development. Learn more about the great things going on in Tiffin and Seneca County at http://www.tiffinseneca.com. As Ohio’s official historic preservation and Main Street Organization, Heritage Ohio’s mission is to foster economic development and sustainability through preservation of historic buildings, revitalization of downtowns and neighborhood commercial districts, and promotion of cultural tourism. Since 1998, Heritage Ohio has contracted with the National Trust for Historic Preservation as Ohio’s state coordinating agency for the Main Street Program™. Learn more at www.HeritageOhio.org. Downtown Tiffin has once again been recognized by Heritage Ohio as a National Main Street Community. This is the second year in a row that Tiffin has received this honor. The Ohio Main Street Program, administered by Heritage Ohio, works with communities across the state to revitalize their historic or traditional commercial areas. Based in historic preservation, it focuses on four points: organization, design, promotions, and economic vitality. Each point is an integral part in the successful revitalization of a downtown area. The Ohio Main Street program is a partner of Main Street America. In 2016 and 2017, Downtown Tiffin received accreditation for its Main Street program from both organizations. Columbus OH – Heritage Ohio is proud to announce the 2017 certification of Downtown Tiffin as a National Main Street Community. Tiffin became a member of the Main Street program in 2016, and since continues to revitalize the historic downtown district. After a half day evaluation process, the board of Downtown Tiffin exhibited evidence of a healthy program working toward measurable outcomes in downtown revitalization. Downtown Tiffin is being recognized as proficient in the ten criteria as set by the National Main Street Center. This designation is a testament to the hard work and commitment of the Downtown Tiffin Board of Directors, staff, and volunteers. Heritage Ohio helps people to: save the places that matter, build community, and live better. As Ohio’s official historic preservation and Main Street Organization, Heritage Ohio’s mission is to foster economic development and sustainability through preservation of historic buildings, revitalization of downtowns and neighborhood commercial districts, and promotion of cultural tourism. Since 1998, Heritage Ohio has contracted with the National Trust for Historic Preservation as Ohio’s state coordinating agency for the Main Street Program™. Learn more at www.HeritageOhio.org. Last week, SIEDC staff attended the Heritage Ohio Annual Conference in downtown Cincinnati. Staff members attended educational sessions on redevelopment, state-wide and national incentive programs, historical preservation and more. We also took walking tours of retail shops, restaurants, business development locations, community developments (such as parks and other public spaces), all within once neglected historical neighborhoods of downtown Cincinnati. Not only did we gather a wealth of information to be used in our downtown revitalization efforts, on Tuesday night, we were joined by Tiffin community members and downtown advocates as we were recognized as an official Main Street Community. We are excited to apply what we’ve learned to our own downtown! Columbus, Ohio – Heritage Ohio, Inc. announced Tiffin has been selected as the newest community to join the Ohio Main Street Program. Tiffin has been participating in Heritage Ohio’s Downtown Affiliate Program, building the capacity needed to be successful in revitalizing downtown. The Seneca Industrial & Economic Development Corporation hosted a seven member selection committee on December 10. During the community review process SIEDC, the Tiffin Historic Trust, and various individuals and committee members had the opportunity to present their program of work as well as answer questions put forth by the selection committee. Tiffin will join an elite group of 23 additional communities dedicated to a comprehensive and highly successful trademarked Main Street revitalization strategy. Current Ohio Main Street Programs include: Cambridge, Chardon, Defiance, Delaware, Findlay, Greenville, Warehouse District (Cleveland), Gateway Neighborhood (Cleveland), Kent, Lakewood, Lebanon, Marietta, Medina, Millersburg, Mt. Vernon, Norwalk, Painesville, Piqua, Portsmouth, Sandusky, Troy, Van Wert, Vermillion, Wooster,). Main Street communities receive intensive training and technical support needed to restore their central and neighborhood business districts to centers of community activity and commerce. The assistance includes volunteer and program manager training, marketing and promotion, business recruitment, market analysis, design, historic preservation and fundraising. The Heritage Ohio Main Street Program will also conduct on-site visits to help each community develop its work program and plan for success. “Tiffin has demonstrated a local commitment to establishing a downtown revitalization program as well as a very impressive partnership between the city, county, industry and colleges,” commented Joyce Barrett, Director of Heritage Ohio. SIEDC is planning an event for the public announcement. 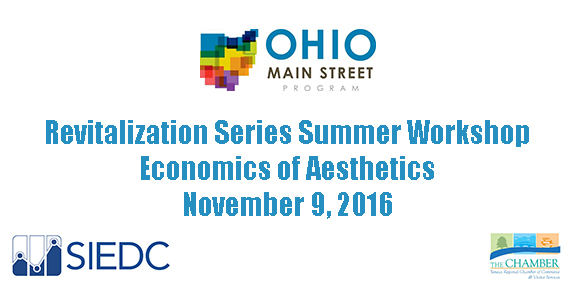 The Heritage Ohio Main Street Program is modeled on the National Main Street Center’s comprehensive approach to downtown revitalization. Benefits of this program include renewed vitality of the downtown/district area along with enhanced economic performance. Today, the Main Street Program has been instituted in 43 states and over 2,050 communities. Nationwide, it has helped create 473,439 net new jobs and opened 109,664 net new businesses creating a total reinvestment of over $55 billion. Heritage Ohio began, as Downtown Ohio, Inc., organized in 1989 is a statewide non-profit corporation that encourages the development, redevelopment and improvement of downtowns and neighborhood commercial district areas throughout Ohio. Heritage Ohio works as a catalyst for downtown and neighborhood district development by gathering together revitalization organizations, conducting statewide seminars and conferences and providing a network of members to share knowledge, common experiences and challenges concerning downtowns and neighborhood commercial districts. Heritage Ohio is dedicated to assisting self-motivated communities through technical assistance, training and networking in all facets of downtown and commercial district development. Heritage Ohio advocates for revitalization and historic preservation issues at the state and federal levels. Additionally, the organization publishes Revitalize Ohio, a quarterly statewide preservation/revitalization magazine. Membership in Heritage Ohio is available to any community, organization, corporation or individual interested in comprehensive downtown or commercial district revitalization. For more information regarding the Heritage Ohio Main Street Program or assistance available to communities contact Heritage Ohio at 614.258.6200 or visit http://www.heritageohio.org.